I’m kind of doing the bachelor thing this weekend. J had to go back to Chicago and because I’m starting a new job, I had to stay here. The bad thing, I wish I could be there with her. The good thing is I get to eat all sorts of crap and not feel bad about it. After making the trip from Grand Rapids, I decided to pick dinner up before heading home. My intention was to pick up BBQ at a place I keep driving past, but that place wasn’t open. Instead, I noticed the brightly colored fish place across the street. I don’t like fish, but these places always have something that I really do love. 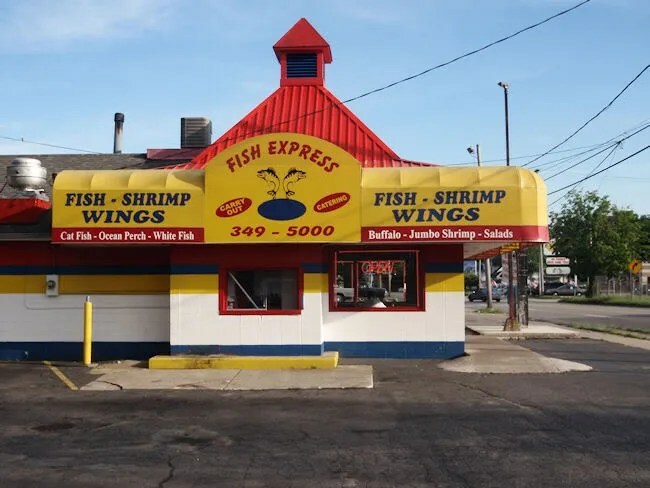 Fish Express is on Riverview Drive and Hotop Avenue in Kalamazoo’s Eastside neighborhood. The building is brightly painted and hard to miss. I did, however, miss the parking lot. I pulled in to the liquor store next door, turned around and headed back to the large parking lot. There weren’t many cars in the parking lot, but the ones that were didn’t pay any attention to the parking spaces. It was kind of a free for all. The inside of the store is pretty small. There’s an order window cut out of the back wall with the menu board hanging above it. There are a handful of tables, but most of the business is carry-out. There is a LCD TV in the corner that was playing the menu for the Bourne Ultimatum DVD. It was really loud and really annoying since it was just a few minutes of music that looped over and over and over. I don’t know if this is a Michigan thing or what, but before moving to Lansing, chicken wings always meant Buffalo wings to me. I was quite surprised the first time I walked in to a place and ordered twenty wings and got whole chicken wings that weren’t covered in wing sauce. They were good though..and something I went back for a few times. 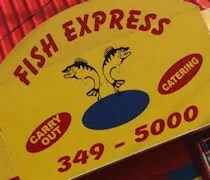 Fish Express also had these same style chicken wings and advertised them on their outside sign. The deal was 10 wings for $6.99. I put in my order and found out it also came with fries. I passed on a drink even though they also had Pepsi. The total was jsut a little over seven bucks. It took about fifteen minutes for the food to come up. I pulled up a chair and waited in a very, very warm dining room. About fifteen minutes later, my number was called and the clerk showed me the Styrofoam container full of food then packaged it up and I headed home. Ten whole chicken wings is equivalent to twenty Buffalo wings, so you can imagine just how much food you get for $7.00. I’m not exactly sure what the seasoning is, but there is some kind of seasoning salt sprinkled on top of the finished deep fried wings. It’s a little salty, but really delicious. I dug into the fries first because they had started to go cold from the ride home. 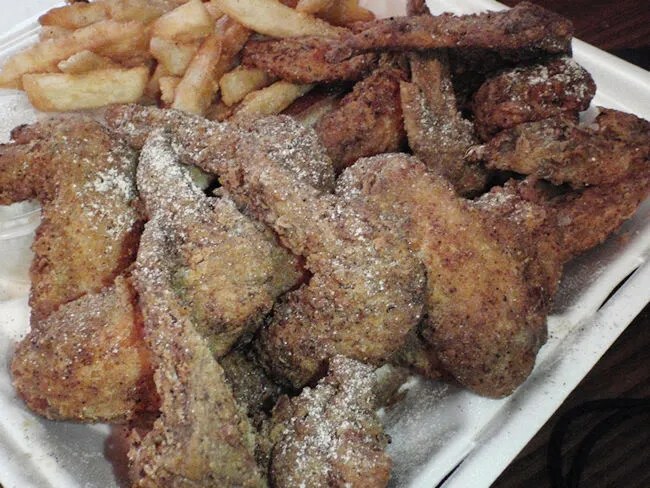 They’re covered in the same seasoning salt as the wings. I have no idea what the rest of the menu is like because it’s mostly fish, but I can tell you, the wings are good. They’re not for everyone. They’re greasy and salty. I was in the mood for BBQ tonight, but I still ended up with a pretty good meal.